Each day we will be giving you an insight into their philanthropic work and their diverse approaches to philanthropy. The judges’ winner will be announced on Tuesday 27th February. All of our finalists will be represented at the ‘Investing in Philanthropy Development‘ WINGS International Meeting for Funders in Barcelona, 26–27 March 2018. Florencia Roitstein, ELLA-Mujeres y Filantropia, Argentina. Florencia Roitstein worked in the public, private and non-profit sectors, including a stint as under-secretary of state for sustainable development in Argentina, before setting up ELLAS-Women and Philanthropy, which she describes as a philanthropic movement for the common good. The initiatives it has launched include a website devoted to the role of women in philanthropy, the first Spanish-language handbook for developing women’s giving circles, two women’s giving circles in Argentina, and a philanthropy initiative involving one of the wealthiest families in Buenos Aires. She believes that philanthropy led by women is a key element of stronger civil societies and greater social justice and democracy. 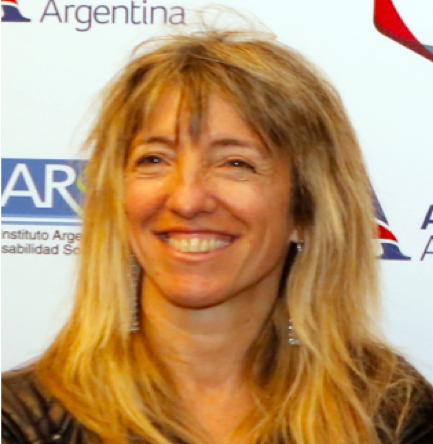 In addition to promoting the role of women in philanthropy in Latin America, she has led cross-sector partnerships, such as the collaboration between the Fondo de Mujeres del Sur (Argentina, Paraguay and Uruguay) and Argentine retailer, Garbarino, in a programme to advance the role of poor women in technology. empowerment and development, so I came up with the idea of an initiative that would promote philanthropy for women by women. I called Andres Thompson, who is an expert on the region’s civil society, and said, “I have this idea. Do you know of any other initiative in the region like it?”. He said, “No, but I’d love to do it with you,” so that’s the way it started and we have run the project together. It’s on a completely voluntary basis. We don’t get any money. Generally speaking in the world of NGOs, people say, “we don’t have money, so we can’t do this, we can’t do that”. The whole idea of the project was to show that we can make social change without creating an institution and that, without resources except for people like Andres and myself who are committed, we have the expertise and can inspire others to join us. Every initiative of the programme has been undertaken without a single dollar in funding. From my perspective, the big philanthropy institutions lack innovation, they lack reach, they lack understanding of the complexity and the ecosystem of social development. It’s disappointing that there are so many organizations working in philanthropy that are very conventional in the way in which they operate and think. I always work from a multi-stakeholder perspective so in every initiative I do, I include people from the public sector, from the private sector, from NGOs and from the media, to put all this experience and understanding of reality together, so I’d say one of my biggest achievements is to inspire people from other sectors to join the initiatives, either ELLAS, or those I put together through ELLAS. We have two big projects on hand, one short-term and one long-term. The short-term one is that we are writing a book on women and philanthropy in Latin America in order to give visibility to new forms which are trying to understand the complexity of social change. We expect to finish that at the end of this year. The long-term project is that we are creating a school of philanthropy for the whole region, based on one we ran successfully for the Fondo Region Colonia in Uruguay in 2017. Governments have not been able to instigate change in Latin America, even in times of economic success – even in Argentina we still have 35 per cent living in poverty – so we need to change the rules and the only way is by making people realize that they have to get involved to create social change. The Olga Alexeeva Memorial Prize is organized annually by Alliance magazine, in association with Charities Aid Foundation, Charles Stewart Mott Foundation, Philanthropy for Social Justice and Peace and Vladimir Potanin Foundation. You can learn more about the Olga Alexeeva Memorial Prize here.